POSTAL WORKER: I worked for the postal service for over 20 years, and, I’m telling you, these packages were never meant to be delivered or to explode. They were meant to be found. 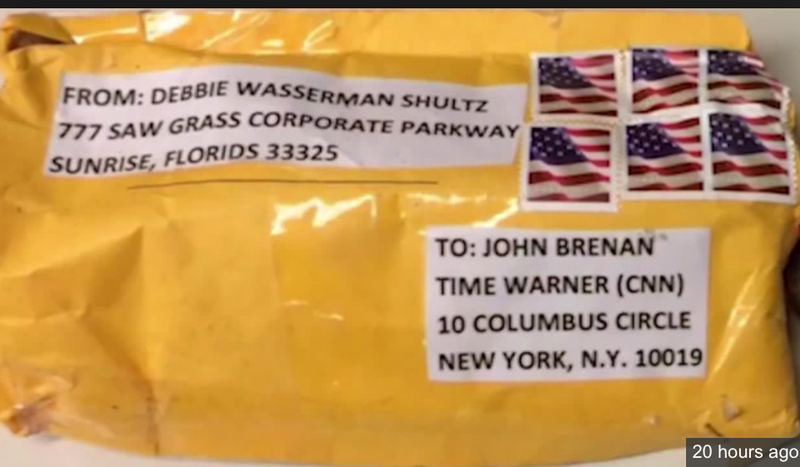 All of the characteristics we are trained to look for in explosive packages are exhibited in these packages. RUSH: What do you mean, “meant to be found”? Tell about that in our limited time. What do you mean, “meant to be found”? ‘Cause they all were found. CALLER: Meant to be found. They all have the characteristics that we’re trained to look for, Rush. 1.) They were not in the correct packages. 2.) They were misshapen packages, okay? 3.) Excessive or not enough postage with stamps. 4.) They weren’t taken to a post office. They were dropped off probably at a processing facility, okay? RUSH: Isn’t the point of a mail bomb that you want somebody to open the damn thing? RUSH: It’s gotta look natural, normal, like almost like somebody’s expecting it? RUSH: Well, no, no. No. Of course. Of course. I mean, if you really wanted the thing to blow up, you need to have it opened. If it’s meant to explode, it’s got to look real, like somebody would open it without giving it a second thought! And what you’re saying is, this is not that. This stands out as being unusual and oddball. I’m glad you called. That helps me understand this. I hadn’t thought of it that way. RUSH: The Drive-By Media is trying to make these so-called bombs sound as deadly as possible. They’re trying to convince you that a Trump supporter, with Trump’s encouragement, sent them even though THEY DON’T KNOW. They want to create that impression so that it will not leave your brain. Lance: None went off. Were all of them meant to be found? Are they the work of a deranged mind or cunning operative? I think you already know who did it – the devil! The person who came up with this idea was inspired by Hell. The intent is to discourage people from showing up and voting. The intent is to get good people TO QUIT. Proverbs says: “The lack of people is the downfall of any prince.” One leader can be seen standing almost alone against a 24/7 cycle of assault from the powerful trifecta of media, academia and celebrity entertainment. One leader against the powerful elites. Trump. As the caravan (mobile mob) on the southern border swells to 14,000, the media mob swells with invective blaming Trump for (of all things) stirring up hate and division! Like the Russia hoax, this odd and convenient new news cycle is justly studied to see if it ends up being another Deep State coup strategy from the opposition party. What have these delirious media wizards put us through? We’ve endured a perpetual national psychic traumatizing. It’s one perpetual click bait, news cycle of assault on Trump. Russian collusion, Antifa roaming our campuses, Stormy Daniels, Kavanaugh, now invading Caravans of funded foreigners seek a “just in time for Midterms” Photo Op on our border. A confrontation gets bonus points I’m sure, while Soros funded evangelicals tour on a bus to lecture Christians, and witches release curses. What could possibly come next? Pipe Bombs. It’s ALL Trumps fault. What if America is no longer buying it? What if the news is reaching a credibility breaking point? Even assuming this is the work of a nut- the media has rushed to judgment and owns NOTHING of its role stirring up the masses to acts of irrationality as it claws at the doors of the Supreme Court. David answeres the big “why” by revealing that the people and rulers didn’t like Gods choice of kings. Of course, Psalm 2 refers to Jesus being exalted as Lord, but it also speaks to cycles of history. Abraham Lincoln was so hated that his opposition, refused to accept the election result and sought to undo it by dividing the country in open defiance of national laws. Much like Sanctuary Cities today. This opposition proudly called themselves “rebels,” not unlike Hillary’s “resistance” movement. An odd choice of words since fallen man is living in perpetual resistance to God. David said the rulers were at war at two levels – “against the Lord and against His anointed” (those He has positioned to do His will.) As it was in 1860 so it is in our current crucible of 2018. Lincoln asked how long a house so divided can stand? God is giving America a moment of mercy. Let us PRAY INTO THIS MERCY and ask heaven to come to the rescue of the divided Republic. Keep yourself from anger, fear or passivity. May God thwart the rebellion. May our appeal to heaven cancel the resistance to mercy. The church is more of a key than we think. We asked for an AWAKENING. May these things arouse us from our slumber and awaken us to a new UNION among ourselves. No Comments on "POSTAL WORKER CALLS INTO SHOW AND SAYS SOMETHING SHOCKING IF TRUE – THE PIPE BOMBS WERE “MEANT TO BE FOUND.”"